Director Bernie Track and her team of American Indian potters have created a hands-on course examining the artistic traditions and process of pueblo pottery of the American Indians for whom pottery making is an integral part of their lives. Students create traditional coil pots from materials collected, literally, from the ground up, using local clay. The coils are assembled into the shape of the piece and then smoothed together, to blend and strengthen the pot. 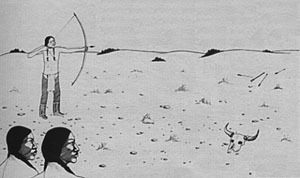 Instead of enclosed kilns, American Indians fire their pots in shallow pits that are dug in the earth, covered with brush and wood, and lit on fire. These in-earth kilns heat the pottery to 1400 degrees, after which they are removed and rubbed with special stones for polishing. In this workshop, students learn traditional drum making using materials, tools and techniques that have been passed down from generation to generation. Over the course of the workshop, students make their own drums - soaking and stretching buffalo, elk, or deer hide onto a flat frame before cleaning the hide with bone-fashioned scrapers. A master hide handler guides them through the process of cutting, shaping, and drying their drums. Accompanying the hands-on process are stories and legends about the role of the drum in ceremonial life, rooting the craft in a spiritual history that dates back thousands of years. They say when an unborn child is developing, the first thing they hear is the heartbeat of the mother so, when babies go to powwows and hear the music, it is just natural. The drumbeat symbolizes the heartbeat of mother earth." Bill Runsabove, Northern Cheyenne composer/singer of traditional songs. Many of these games were developed centuries ago. Simple rocks, stones, sticks and pieces of leather were used in imaginative ways to create games that honed skills needed for hunting, tracking and survival. These games can be divided into two classes: games of chance and games of dexterity/strength. Games of chance were created to develop risk taking, competition, and the power of observation and intuition. Games of dexterity were designed to develop stamina, strength, agility, and speed. At the Art Ranch, playing these games provide a fun and exciting environment for students to enhance their social development and collaborative abilities.